Norton Bush was first noted for his portraits, marine views and landscapes of the East Coast and California. Later in his career, after visiting Central and South America, Bush devoted himself to his favorite topic, painting tropical scenery. Norton Bush was born in Rochester, New York, Feb.22, 1834. He first studied art in his native city under James Harris. He studied with Jasper Cropsey after moving to New York City. He received criticism from Frederick Church who was already famous for his lush tropical scenes. It was Church who encouraged Bush to paint tropically. In 1853, Bush came to California via the Isthmus of Panama and the Chagres River. He made San Francisco his permanent home. In 1868, he opened a studio in that city. 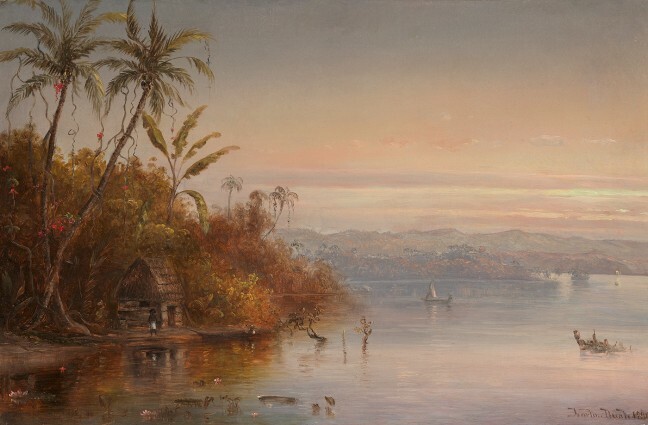 During a visit to Panama in 1868, Bush obtained material for a series of landscapes he painted for the late William C. Ralston. These paintings were hung on the walls of the Sharon residence in Belmont, California. On a trip to Peru, where made sketches of Mount Chimborazo, Bush also crossed the Andes, drawing the famous El Miste, Mount Meiggs and other exotic scenes. Bush was a frequent contributor to exhibitions held in San Francisco and at state fairs in Sacramento. He also exhibited at the National Academy of Design in 1852 and in 1871. Elected a member of the San Francisco Art Association in 1874 and a director in 1878. Bush died in San Francisco in 1894.